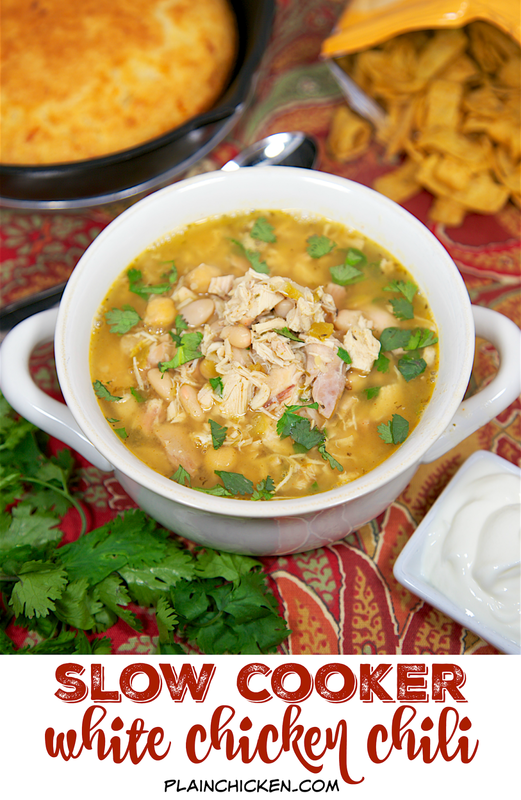 Slow Cooker White Chicken Chili recipe - chicken, seasonings, cannellini beans, chickpeas, green chilies - top with cilantro, cheese, sour cream and Fritos! SO good! Just dump everything in the slow cooker and forget it. Complete the meal with some cornbread. Quick and easy weeknight meal! I love using my slow cooker this time of year. It is great to be able to dump everything in and forget about it during the busy holiday season. 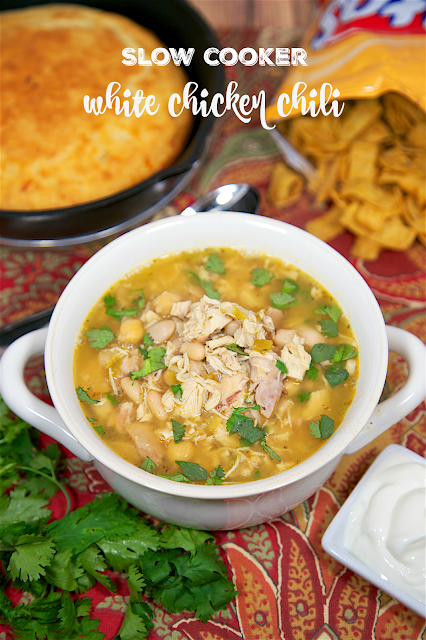 This recipe for White Chicken Chili is so easy and tastes fantastic! 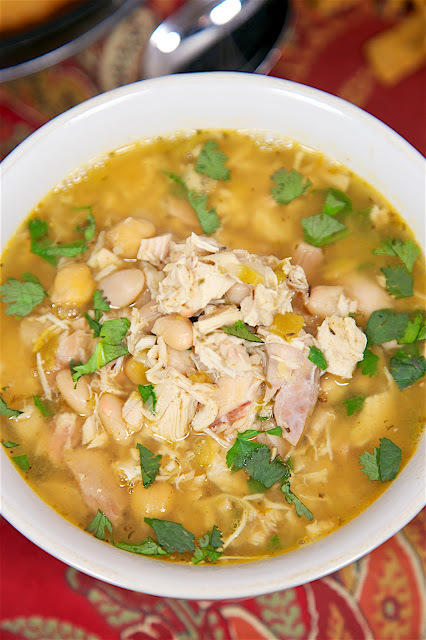 This recipe is a little different from my usual White Chicken Chili recipe. 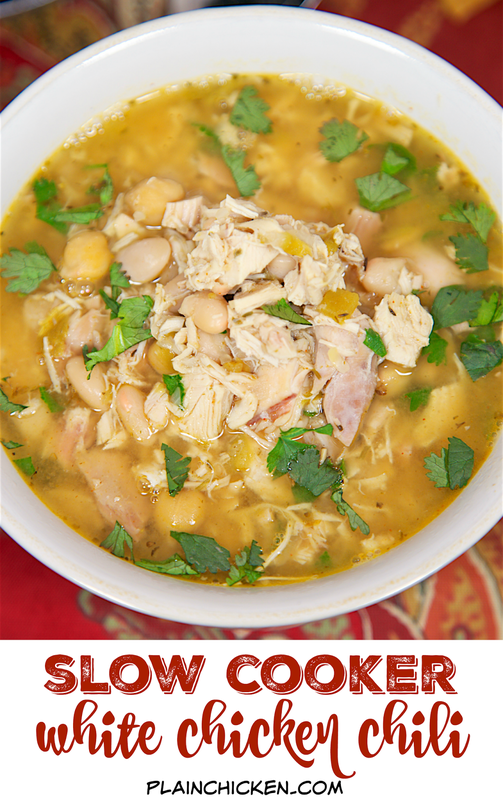 One of the main differences is that it has cannellini beans and chickpeas in the recipe. I wasn't sure about the chickpeas, but we both really enjoyed them in the soup. We ate this for dinner and froze the leftovers for later. We topped the chili with some cilantro, cheese, sour cream and Fritos. You can totally skip the cilantro if you aren't a fan. Complete the meal with some homemade cornbread! A quick and easy weeknight meal! Perfect for a chilly winter night! Combine all ingredients in slow cooker. Cover and cook on LOW for 6 to 8 hours. Serve with cilantro, cheese, sour cream and Fritos. Sounds like a winner, especially with the cumin and chiles. I know that there's a ton of white chili recipes but I like this one a lot. The broth looks perfect.